The lakes region is located in central Tasmania to the south of the Great Western Tiers, and is largely responsible for Tasmania's growing reputation as an angler's paradise. Peak trout fishing occurs in January and February. When lake levels are high, it is possible to engage in sighted fishing, where the angler wears polarised glasses allowing an individual fish to be spotted and a fly presented to it. Fishing is not the only activity of interest in the lakes region. Some of the thousands of lakes were formed through glacial action, whereas others are due to well-established hydro-electric schemes. The Waddamana Power Museum is at the site of Tasmania's first power station, built in 1910. Wayatinah is another "hydro town", and is close to many operational dams and power stations. Miena area: Great Lake, Little Pine Lagoon, Arthurs Lake. Miena hosts the Tasmanian Trout Fishing Championships in each November, and has two 2½-star lodgings. Great Lake is one of the largest high-water lakes in Australia. Bronte Park area: Lake Echo, Bronte Lagoon. Bronte Park is a former host of the World Fly Fishing Championships, and both 4-star accommodation and backpacker lodging is available. Those who opt for the former also have access to two private lakes. Tarraleah area: Brady's Lake, Lake Binney, Lake Tungatinah. Guided expeditions available; cabin hire and 3½-star accommodation available. Derwent Bridge area: Lake St. Clair, Lake King William. 3½-star accommodation available. 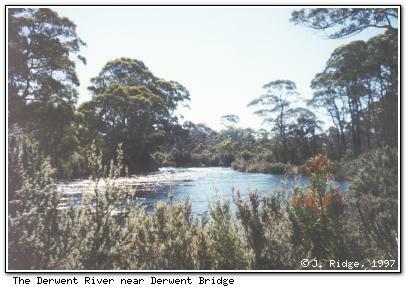 The Derwent River (pictured above) flows from Lake King William. Interlaken area: Lake Sorell, Lake Crescent. Waddamana area: Woods Lake, Penstock Lagoon.